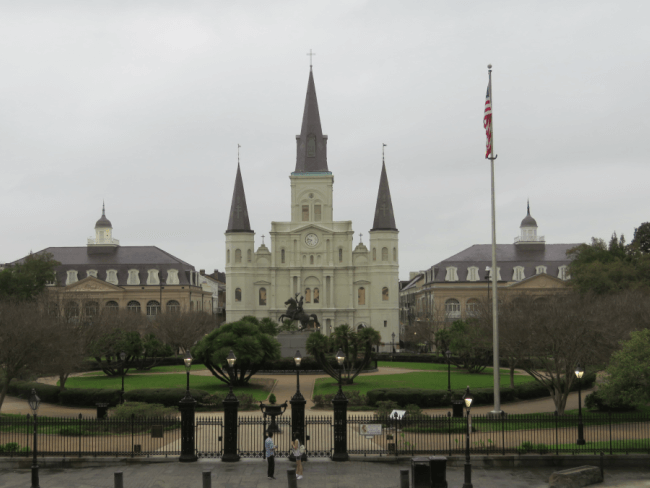 Jackson Square and St. Louis Cathedral. I have visited New Orleans and the French Quarter three times. 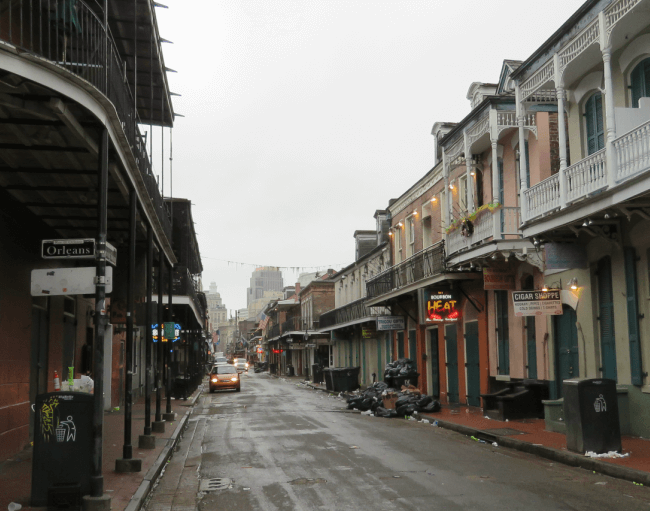 As a child, I mostly remember seeing the Superdome and the narrow, crowded streets. 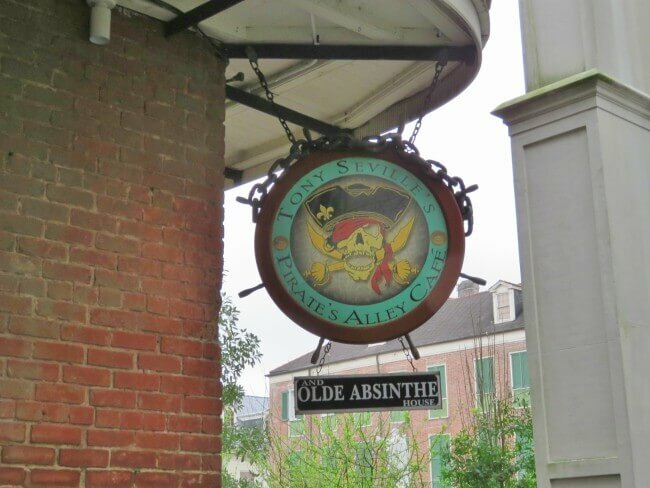 As a college student, I wanted to find sites from Anne Rice’s Interview with a Vampire. In the evening, I listened to zydeco and jazz music in Bourbon Street bars while sipping Abita Beer. Returning as a presumably responsible husband and father, my interests were quite different. I wanted to experience the history and architecture. The French Quarter did not disappoint. 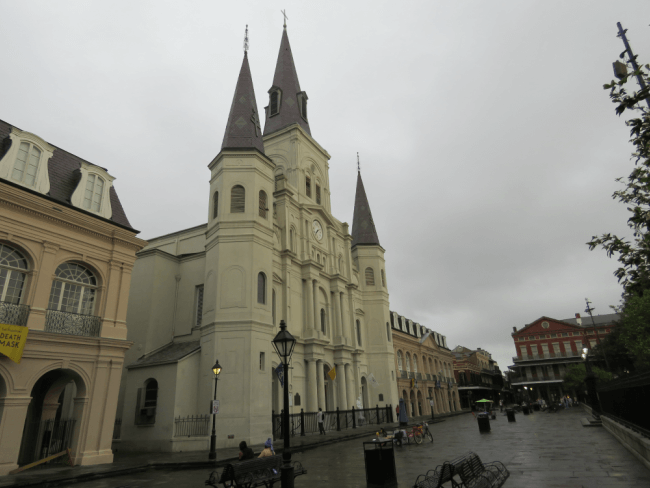 Wandering the streets on a cloudy Sunday, I was once again thrilled by the Crescent City. Few places in the U.S. boast a history and culture as rich as the French Quarter in New Orleans. African, French, Spanish, and American customs mix to create the unique Louisiana creole culture. Founded in 1718, New Orleans passed from France to Spain and back to France prior to being sold to the United States by Napoleon in 1803. Flowers adorn buildings through out. New Orleans lies almost 100 miles up the Mississippi River from the Gulf of Mexico. It has been and remains an important port. 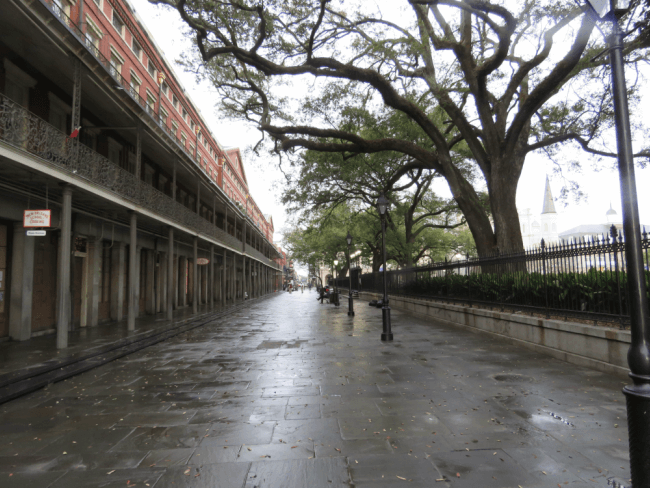 The French Quarter is the original, oldest section. Historical figures like President Andrew Jackson and the pirate Jean Lafitte both helped form New Orleans. Jazz great Louis Armstrong and author William Faulkner, gospel singer Mahalia Jackson and TV personality Ellen Degeneres all hail from New Orleans. What a rich and diverse mix! Take a tour on a horse drawn carriage. 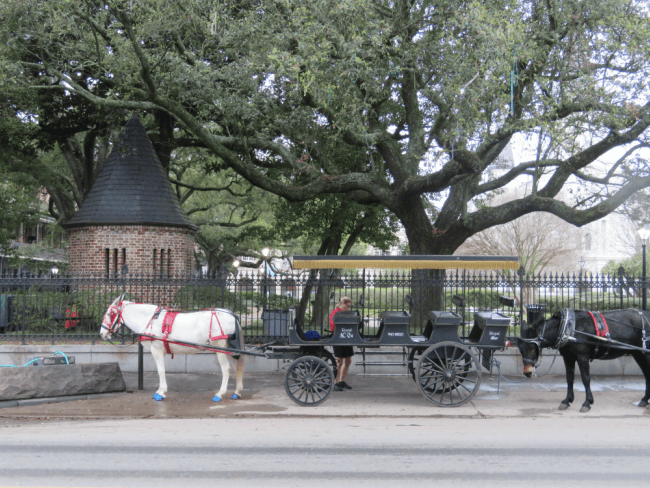 Walking tours, bicycle tours, hop-on/hop-off busses, or horse drawn carriages all provide means for touring the French Quarter. Unless you want a specialty tour like the New Orleans Ghost Tour, then you really do not need one. With your phone or an old-fashioned map, you can easily walk the best of French Quarter. About 1.25 miles (2 km) covers most of the major sites. Exploring shops and museums, enjoying cajun cooking, and listening to street performers makes for a wonderful day. Bourbon Street early on Sunday morning is packed with trash and wreaks. 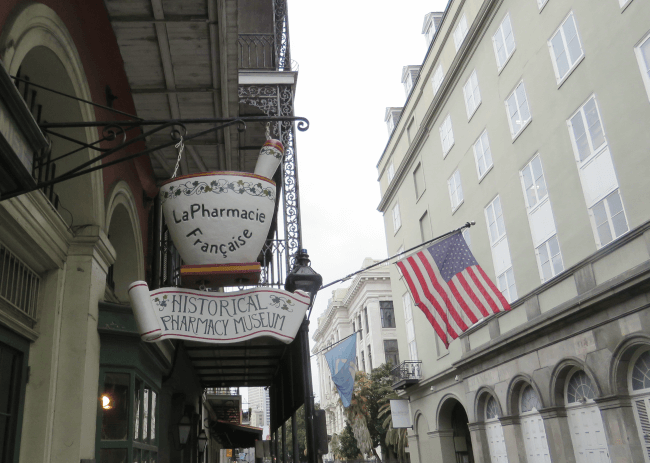 For most, the French Quarter conjures images of Bourbon Street and Mardi Gras. Bourbon Street lives up to its party reputation. It is filled with restaurants, bars, strip clubs, and gift shops aimed squarely at tourists. It was much more interesting to me when I visited in my early 20s. Today, I no longer find it appealing. All of the trash in the above photo will help explain why. It strikes me as dirty, tacky, and smelly. 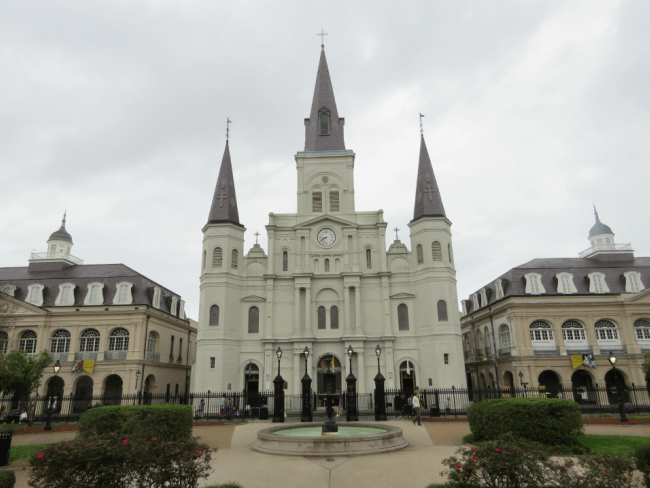 The true heart of the French Quarter is found at Jackson Square. A statue of Andrew Jackson stands in the center of the park. Andrew Jackson led the U.S. in the Battle of New Orleans and later became the seventh president. 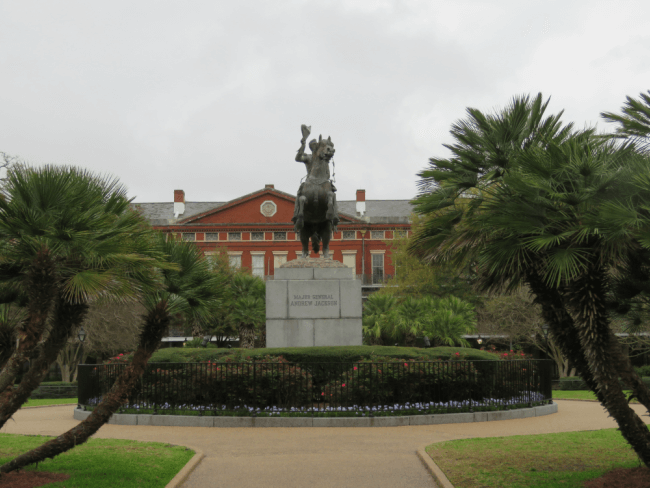 For 300 years, life in the French Quarter has revolved around Jackson Square. 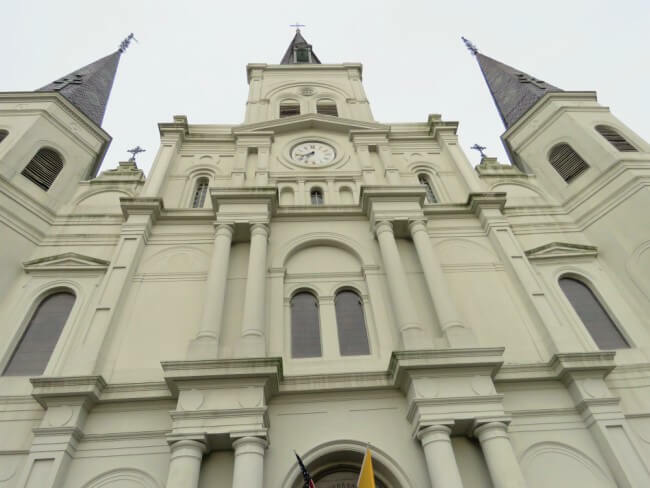 St. Louis Cathedral reaches to the sky like a striking, triple exclamation point. It is the obvious focal point. The white cathedral is absolutely stunning. 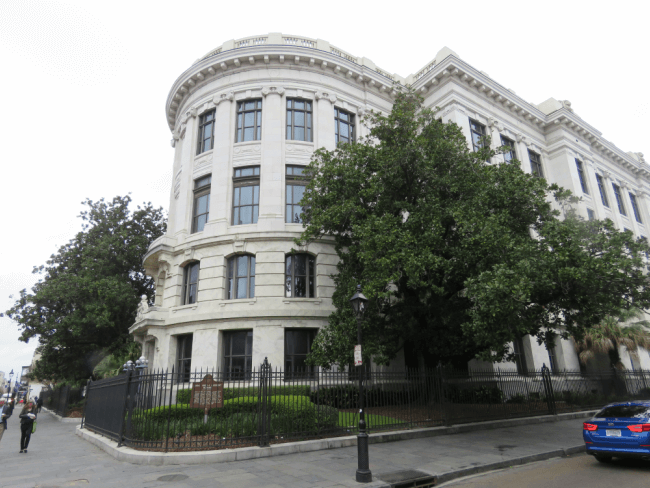 Take amazing photos of Jackson Square from across Decatur Street. Steps lead to an elevated platform atop the levy. Now called Washington Artillery Park, it provides a wonderful view of St. Louis Cathedral and the Mississippi River. 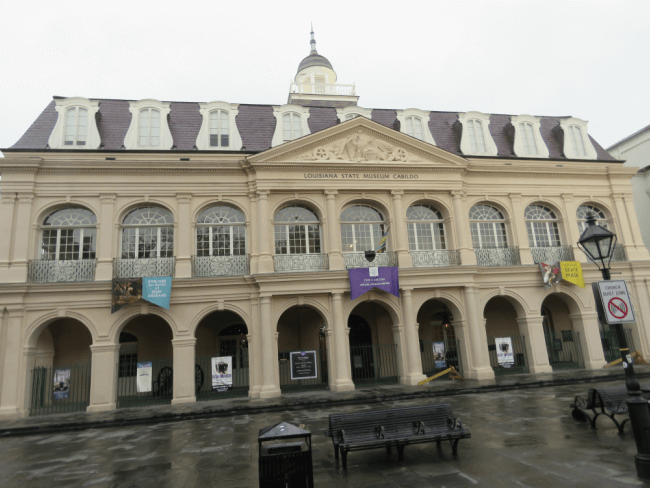 The identical Cabildo and Presbytere buildings flank St. Louis Cathedral on each side. Previously a courthouse and a home for priests, both now house museums. 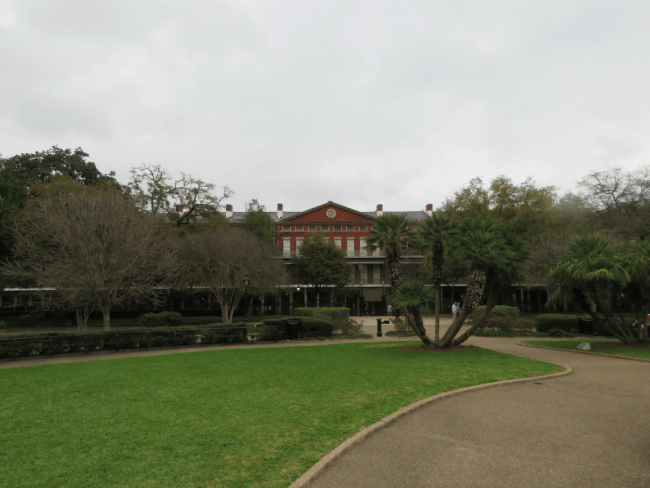 The Pontalba buildings complete the other sides of Jackson Square. These matching, red brick structures are filled with interesting shops on the first level as well as the 1850 House. 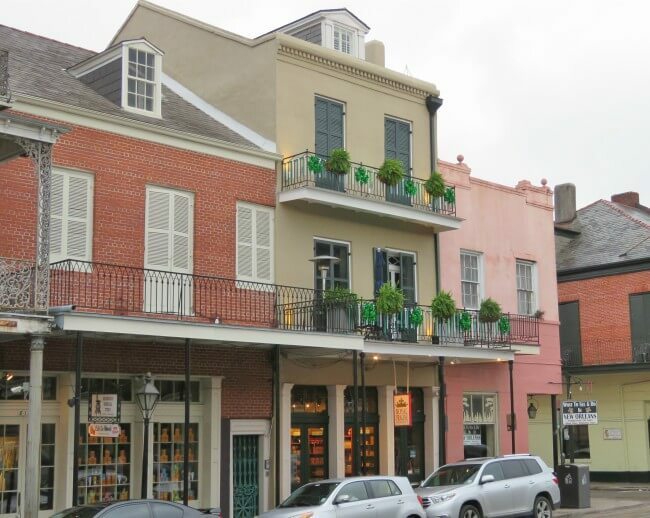 The upper levels contain the oldest apartments in the U.S. 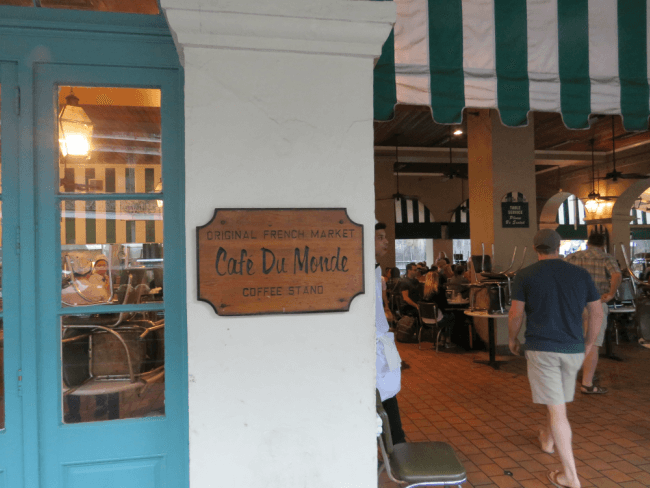 The Cafe du Monde, located across Decatur Street, serves its famous coffee and chicory blend with beignets 24 hours a day. 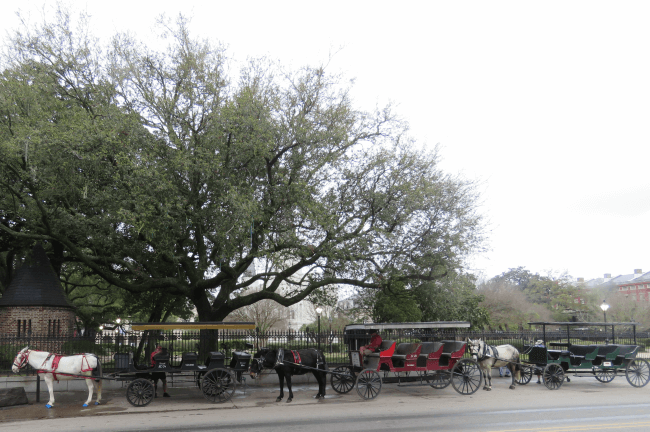 Early in the morning, horse drawn carriages line up here for tours of the French Quarter. 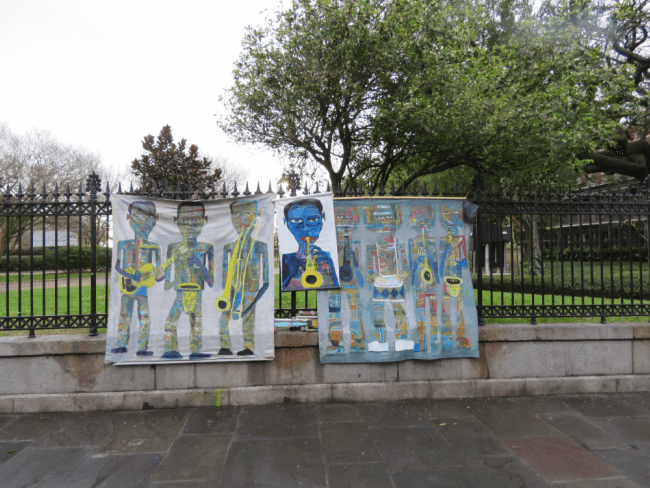 Artists and musicians ply their trades around the square. While Bourbon Street is more well known, I prefer to browse Royal, Chartres, and Decatur. Colorful boutiques, hotels, and restaurants line the streets. 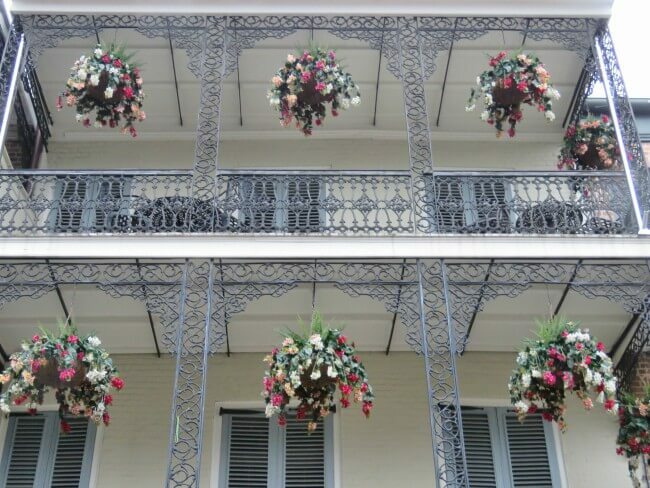 Intricate, wrought iron trim and balconies adorn the dwellings. Flowers hang from windows. 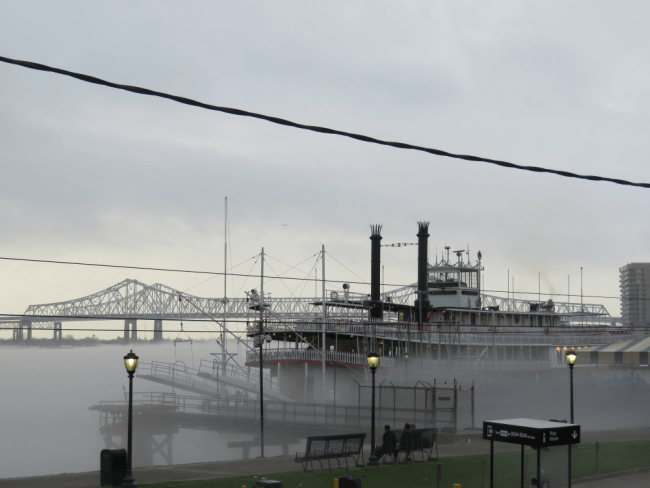 The riverboat Natchez docks on Decatur Street. French Quarter ambiance abounds without the smell of Bourbon Street. This site has a wonderful list of attractions, an interactive map, and a guided tour. A taxi dropped me off at Jackson Square. Using the map from the above site, I started at Cafe du Monde. What better way to start a day than with cafe au lait and a beignet! 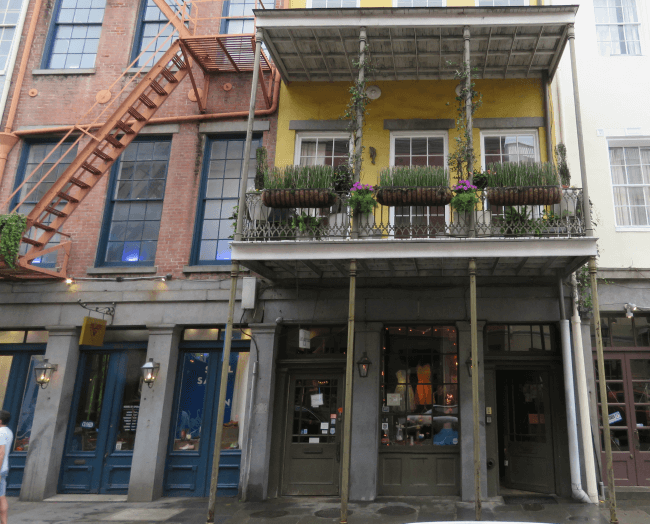 In roughly 1.25 miles (2 km), I viewed 20 of the best French Quarter sites. I had a wonderful day exploring. 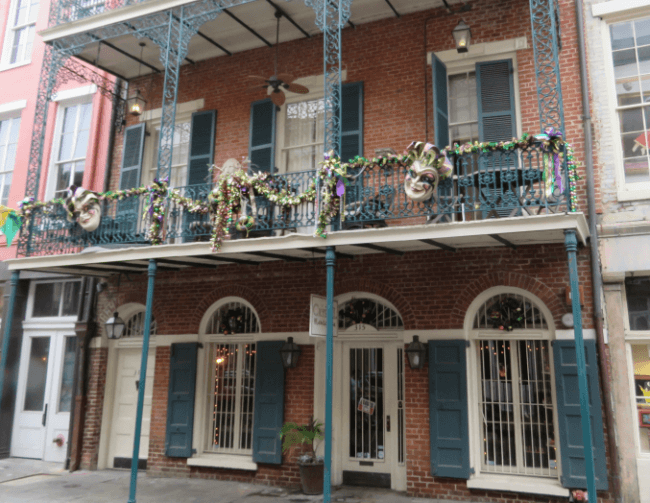 The French Quarter of New Orleans makes a great, family travel destination. It is not just for revelers. Following one of the above maps or plotting your own, you can spend a fun-filled day. Explore history and culture. Shop galleries, flea markets, and art stands. 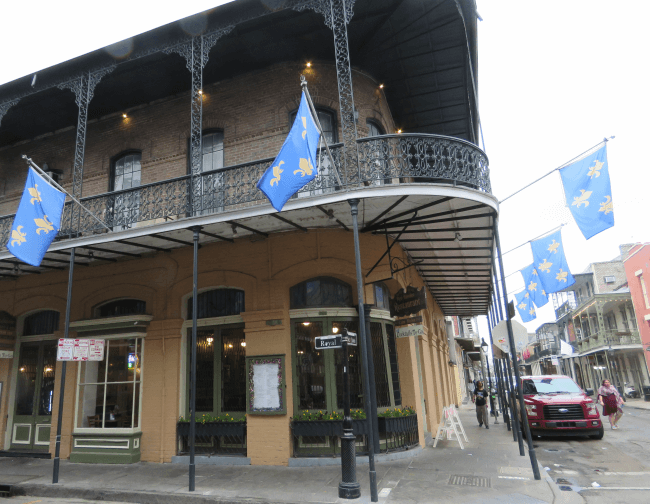 Eat gumbo, etouffee, or a po boy at Daisy Dukes. Enjoy a street musician. To get your teens interested in New Orleans, consider watching A Streetcar Named Desire and/or The Curious Case of Benjamin Button. For younger children, Disney’s The Princess and the Frog will do the trick. You will want to return! We went to New Orleans for our honeymoon, but haven’t been back since. It is still one of the best food and music experiences we’ve had. 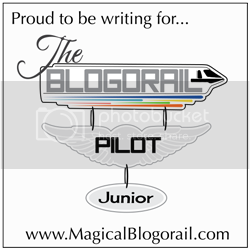 This post is inspiring me to make a return trip. There is a lot to do there and many beautiful places! I love the food and the music, too. I was able to enjoy the great cajun cuisine, but did not get to listen to any music this time.